Dear Doctor is the leading provider and publisher of educational information and illustrations targeted specifically for dental patients. 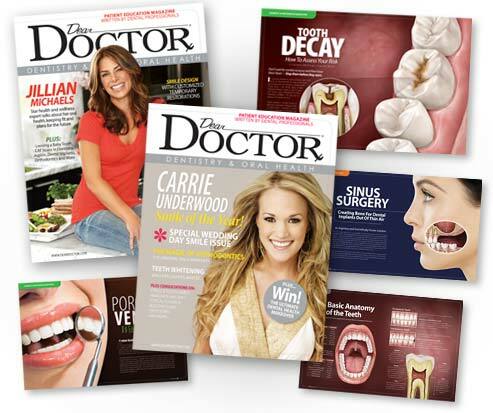 Its flagship product, Dear Doctor - Dentistry & Oral Health, is a nationally published quarterly magazine with professional endorsements within their area of expertise from prestigious professional organizations including the American Academy of Cosmetic Dentistry (AACD), American Academy of Endodontists (AAE) and the International Congress of Oral Implantologists (ICOI). Dear Doctor has mastered the perfect balance between a content-rich scientific journal and an entertaining, easy-to-understand resource that readers relate to and trust. Questions? Call (845) 765-2310 x.110 and speak with a Dear Doctor representative. © 2013 Dear Doctor, Inc. All images and text on this site belongs to Dear Doctor, Inc. Copying or reproducing any text or graphics from this website is strictly prohibited by US and international copyright laws.